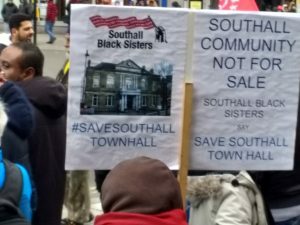 Around 100 people joined Southall’s Februrary 9th Day of Action and the campaign to retain Southall Town Hall as a hub for the Southall community. Flags and banners made for a highly colourful demonstration which attracted the attention of London ITV cameras and local media reporters ExposureBox. The Town Hall is the home to the Southall Community Alliance which plays a vital role in bringing together groups from across the community. Its disposal will leave the Alliance homeless. Campaigners described how the Council had previously secured the Town Hall for the Community Alliance, and say it is being sold now for less than the money they have since put into it. They complain that though they were operating out of the town hall and are well respected for their role in the community, they were refused permission to register it as an asset of community value on the grounds that some businesses also operated from the building. 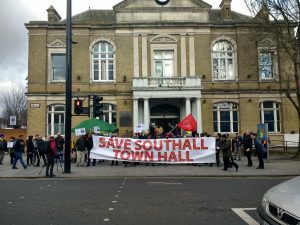 A legal challenge to the disposal plans has been lodged and the fight to save the Town Hall for the community’s continued use is likely to be a protracted one.